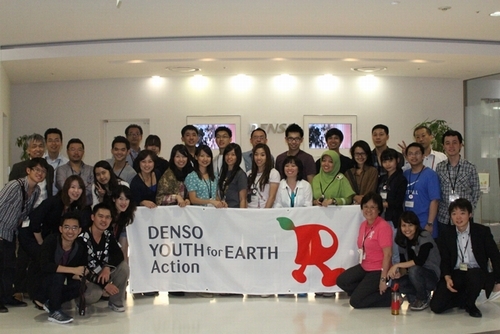 DENSO Corporation, a major Japanese supplier of automotive systems and components, co-sponsored by the Japan Environmental Educational Forum (JEEF), has held DENSO YOUTH for EARTH Action every year since 2008 as one of its corporate citizenship programs in environmental responsibility. The program aims to train Asian youths aged 18 to 29 to become environmental leaders who can think globally and act locally. In fiscal 2012, a three to four day local program was held from the July to September in Thailand, Indonesia, Malaysia, the Philippines, Vietnam, Singapore and Japan, with about 20 people in each country participating. Through fieldwork and discussions, participants studied and developed Individual plans to take action in their respective communities, and presented their action plans on the final day. Following the local program, the global program was held in Japan for 10 days at the end of October, with about three people selected from each local program competing. Final selection contest will be held from January to February 2013 in each country. With support from DENSO staff, the top performers will spend a year implementing their action plans. Action plans selected in the past include a seminar for university students on corporate social responsibility (CSR), and a workshop to promote at-home worm-composting. Asian youths who participate in the program are expected to show future leadership in environmental protection.